I recently spoke to a group of awesome mommas (AKA Branson MOPS AM) about fever in their kids. I think with the dreaded flu being so rampant right now it’s a perfect time to address fever and how to properly treat it. Let’s define what a fever is. Fever is a temperature measuring greater than 100.4. The most accurate way to check your child’s temperature is unfortunately a rectal temperature until they are old enough to hold the thermometer beneath their tongue. (I’m not saying you’re required to hold down your 2 year old and take a rectal temp….please don’t do it.) You can still check the temperature via the armpit, ear, or forehead. Just know that they are not technically as accurate. Your child is younger than 3 months old and has a fever over 100.4 rectally. If they are running a fever and refuse to drink fluids. Your child (age 3 months to 3 years) has had a fever over 100.4 for more than 3 days. 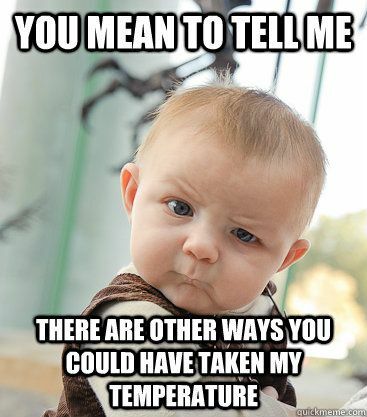 Your child has had a fever measuring over 104 by mouth or an armpit temperature over 103. And as I always love to say, FOLLOW YOUR MOMMY GUT. If there is a question they need to be seen, then at minimum call. They can then help you decide what you need to do and if you need to be seen. But if you read nothing else, read this: FEVERS ARE A GOOD THING. STOP FEARING THEM! Remember we offer Evisits. This is great to utilize for after hour care or weekend illnesses. Because let’s be honest every kid we know doesn’t get sick until after 5 PM on a Friday evening. Click HERE for an Evisit appointment. As always I hope you stay happy and healthy! PS- MOPS, thank you again for having me! As always I loved being with you all!